I love every single one of our sports franchises. And I like to think that they love me, too. After all, they are always telling me how much they appreciate my devotion (not to mention spending money). But sometimes they have a really funny way of showing it. Between all of the losing seasons, bad trades, shattered playoff dreams, and threats to leave me for someone else I sometimes wonder if they really do love me after all. I mean, how much heartbreak is one fan supposed to take? I’ve asked myself, how much do you commit yourself? They’re always breaking up with me, too. Not just players, the franchises themselves sometimes decide they want to start seeing other people. The Lakers (probably the best franchise Minnesota ever had), North Stars, and now (probably) even the Vikings have all moved on to bigger and better things. The Twins claim to be in it for the long haul, but they’ve threatened to leave so many times I’m not sure if I can trust them anymore. Do I love you, do I hate you, do I got a dyslexic heart? The Vikings are the NFL version of the Cubs: there’s always a lot of preseason hype that this is going to be the year. The year our long championship drought comes to an end. And then they usually find themselves out of contention by week 5. 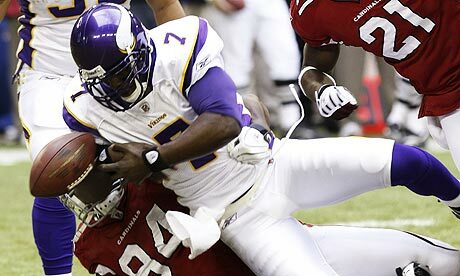 Even if the Vikings do somehow manage to sneak into the playoffs, they always get sent packing in the first round. I love the Vikings, and I want to believe in them. Owner Zygi Wilf certainly isn’t afraid to make bold, expensive mistakes moves to improve the team. He wants to win, and I admire that. But every year there’s something, some gaping hole the front office failed to address while overspending on something else. Last season, the Vikings spent a lot of money upgrading their receiving corps, and made a huge trade for Jared Allen to shore up their swiss-cheese like defense. But then they forgot to get a decent quarterback, and the Eagles made them pay dearly for it in the playoffs. This season they’ll probably put all of their efforts into finding a quarterback, but neglect other needs such as oh, I don’t know, special teams or something. I’m not going to lie, we’ve had some good times. There was the 2004 Western Conference finals, for example. Even though they lost to the infernal Lakers (curse you, Kobe Bryant! ), the very idea that the Wolves could win a championship title was exciting. And with all of the talent on that team we thought they’d be right back in it again the next year. Ha! is going to miss the entire season with a torn ACL. Oh, he’ll probably be fine and he should be back next season, but I wonder if this team is even going to win another game without him. Probably not. Looks like we have yet another high draft pick to look forward to. Yay. Ugh, last night’s game was one of the worst I’ve ever seen. It didn’t start out that way, though. The Wild looked really good in the first period after they took a 3-0 lead over Ottawa at the X. But then they got lazy and allowed the Senators to score 5 unanswered goals, two of which were shorthanded! I’m not trying to take anything away from Ottawa, they do have a lot of young talent and are a very hot team right now. But the Wild really gave the game away and it was just brutal to watch. Let’s face it: the Wild aren’t going to make the playoffs this year. And we will look back on this game as the one that killed their chances. Yes, they dug themselves a massive hole in December, when they went 3-9-1 and were dead last in the Northwest Division. But they were starting to really come together and play well as a team; they were starting to show some fight and it made us all hope that they could make it after all. And that’s really the most frustrating thing about this team: they can play like an elite hockey team if they choose to do so, but more often than not they just don’t. Besides, a last-place finish probably would have been good for them. At least this way they could’ve gotten a higher draft pick. For a team that doesn’t have a lot of assets, and is set to lose at least one, if not two of its biggest stars via free agency, having an off year wouldn’t have been such a bad thing at all. Sweet dream baby. How long must I dream? I was nine years old the last time the Twins won the World Series. 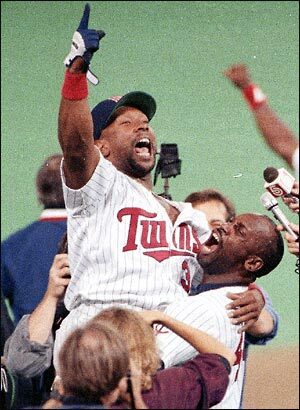 Kirby Puckett’s game winning bomb off of Charlie Leibrandt in the bottom of the eleventh inning in game six was the second-greatest moment of my childhood. The greatest moment, of course, was Gene Larkin’s bloop hit (What else? That’s how the Twinkies do it) to left center that scored the winning run in game seven that clinched the Twins’ second World Series title in four years. I love the Twins, I really do. And nobody wants to see them win another championship more than I do. But nobody is more realistic about their chances this season than I am, either. They have a lot of young talent, but this team as it is constructed right now just isn’t going to get the job done. Other than Justin Morneau, there isn’t another hitter in the lineup that makes opposing pitchers nervous. And other than Francisco Liriano, none of the pitching staff strikes fear in the hearts of opposing hitters. The bullpen should be better this year, but even that’s a big question mark. The division will probably be up for grabs again this season, and I’m sure the Twins will probably win it. But I’m afraid that’s all they’re going to win. Thanks to Kathy over at redbirdchatter for inspiring me to express my feelings towards my beloved sports franchises through song. Ugh, I awaken this morning from my drunken stupor to discover this is Bill Smith’s idea of fixing the bullpen. Jarrod Washburn for Delmon Young? Really?? I don’t want to panic yet, as this is just a rumor so far, but if this is true then we might as well give up hope that the Twins will ever contend for a World Series title with Smith at the helm. I am really, really hoping that this is nothing but wishful thinking on Seattle’s part, but considering that the Twins recently broke off talks with Eric Gagne because a trade was supposedly eminent there is enough reason to be concerned. I have already written a lengthy piece on why I think trading Delmon Young would be a mistake at this point. Maybe I should send it to Bill Smith, since he evidently doesn’t read this blog. But I think it bears repeating: unless Adrian Beltre is involved (and apparently he isn’t), there is no reason whatsoever to mention Young in talks with the Mariners. This proposed trade makes no sense for the Twins on so many levels it makes me wonder if Smith even knows what in the hell he’s doing. First of all, why on earth is Bill Smith so enamored with Jarrod Washburn? I know he tried to claim him off of waivers last summer until the M’s revoked them. I though they dodged a giant bullet then, though at least he could’ve been acquired much more cheaply. It’s clear that Washburn is, well, washed up. At 34, his best years are already behind him and he’s coming off of a less-than-stellar season with the Mariners. Last season, he posted an ERA+ of 90. In comparison, the pitchers he would likely be replacing in the bullpen, Boof Bonser and Philip Humber, posted ERA+s of 78 and 88, respectively. The Twins already have a similar pitcher in Craig Breslow, who posted an ERA+ of 249 last season. All of these pitchers have more upside than Washburn because they are all much younger and about $9.5 million cheaper. Washburn is going to be paid $10 million this season, and although the Mariners would have to eat a good chunk of that for the Twins to agree to a deal, it’s still way too much money for pitcher who isn’t very effective anymore. Worse yet, Eric Gagne had reportedly agreed to meet the Twins’ asking price. Gagne is hardly the dominant pitcher he used to be either, but he would have been a much better investment than Washburn. Especially since he probably would’ve only cost the Twins $3 million for a one-year deal. Catcher Jeff Clement is also rumored to be part of the deal. Once again, I have to ask WHY??? Joe Mauer will probably be ready for Opening Day, but even if he isn’t the Twins have a very competent backup in Mike Redmond and a top prospect in Wilson Ramos. The only reason this would make sense is if the Twins are planning to move Clement right away as part of some other deal. ng something of value in return!!! But if these rumors are true, and this move is actually made, then the Pohlads really need to consider whether or not Smith is the right man for the job. It took his predecessor Terry Ryan six years to put a winning team together, and Smith seems intent on dismantling it in just two seasons. UPDATE: Oh, this is even worse than I thought. According to the Twins’ website, Smith is interested in acquiring Washburn AS A STARTER!!! Is he out of his freakin’ mind?! Why on earth would you trade for another starter when you have gigantic holes at third and in the bullpen?!?! Written by mlblogsplunkinggomez 5 Comments Posted in Dailies	Tagged with colossal wastes of money, crappy relief pitchers, Delmon Young, ill-advised trades, Jarrod Washburn, Jeff Clement, Mariners, sometimes it&apos;s really hard to be a Minnesota sports fan, what were they thinking? Today is my 27th birthday, and man I feel like an old lady. Part of it is because I am sort of a non-traditional college student, so I go to school with a bunch of 18-year olds and they have a habit of making you feel old. I have also come to realize that pretty much the entire Twins team this year is younger than I am. I’m older than every single one of the starting pitchers, half of the infield, and most of the outfield, too. While this is good news for the team, it’s kind of bad for my ego. Plus, I found some grey hairs not too long ago. As I have written elsewhere, it’s probably from being a Minnesota sports fan. Or it could be because everyone in my family has started to go grey before they turn thirty. Nah, it’s gotta be the sports thing. I am so old I can remember both of the Twins’ most recent World Series titles (although I just vaguely remember the ’87 Series). Good times. I am so old I can remember when guys like Scott Stahoviak and Pat Meares were considered key pieces to build the team around. Thank goodness things have changed. I am so old I can remember the last time the Vikings were actually favored to win the Super Bowl. Losers. I can also remember when basketball returned to Minnesota. People were really excited about it, too. Well, it seemed like a good idea at the time, anyway. I am so old I can remember the Montreal Expos, Vancouver Grizzlies, Houston Oilers, Hartford Whalers, Winnipeg Jets, Quebec Nordiques, and the first incarnation of the Cleveland Browns. I remember when the Rams were still in Los Angeles. I’m not quite old enough to remember the football Cardinals being in St. Louis, though, which makes me feel a little better. I remember when they were still called the California Angels, and not the Los Angeles Angels of Anaheim or whatever it is they call themselves these days. I remember when Florida didn’t have any baseball teams, let alone two. I remember that they kept threatening to steal ours, though. I can remember a lot of important things, too. I remember when the Berlin Wall came down. I wasn’t really old enough at the time to grasp the historical significance of it, but I thought it was cool that people were smashing things on television. And I really liked David Hasselhoff’s leather jacket. Yeah, I know. Don’t ask. I kind of remember a time when the Soviet Union was our biggest enemy. I also remember when the Soviet government collapsed under its own weight. I remember that people were really scared, because everything was in such chaos and nobody knew what was going to happen. I also remember that the Soviet people felt this overwhelming sense of hope, that they could look forward to a future free from the tyranny of the Communist regime. Yeah, good luck with that. I don’t want to sound too much like an old fart, but technology has really changed since I was a kid. Most people still didn’t have computers in their homes, even when I was in high school. They were just too expensive. Same thing with cell phones. They didn’t have all that fancy stuff like cameras, or email, either. I don’t even think you could download ringtones back then. I kind of miss those days. We thought we were soooo cool because we liked music that nobody else we knew liked. Having indie cred was really important back then. If you weren’t the first person to discover a band, or at least a fan since the very beginning, then you were a poser (a front-runner, if you will). I’m not sure anyone really cares about that stuff anymore. That was back when recording an album was actually kind of important. The internet has changed all of that. There’s no point in making a masterpiece like Let it Be anymore, when all people want to hear is “I Will Dare“. I remember when I was excited about the internet and how it was going to totally revolutionize the music industry. I grew up in a rural area, and it was really hard to find the music I liked. If MTV didn’t play it (yes, believe it or not there was a time when MTV actually showed music videos) then the big-box stores didn’t carry it, and you were out of luck. But the internet was going to change everything, it was going to be so much more democratic. The little bands were going to have just as much of a chance at being heard as the big bands. And that’s kind of true. But people have lost patience in the meantime, and now refuse to sit through an entire album when they really only want one song. Even if the entire album is actually worth listening to. Ok, now I’m really depressed. I think I’ll go back to bed. Delmon Young shows up at TwinsFest and he’s in shape! I will take this as a good sign. It’s an understatement to say that Young is not exactly a fan favorite. Although he’s behaved himself for the most part, he got off to a very slow start and isn’t one of the best defensive outfielders I’ve ever seen. To make matters worse, the players who were shipped off to Tampa Bay ended up playing an integral part of the Ray’s’ amazing run. Matt Garza is becoming a superstar, and Jason Bartlett provided a significant upgrade in the infield defense. Watching the Rays play in the World Series while our own team didn’t even make the playoffs was kind of tough. Coupled with the fact that his own manager expressed doubts about him as an everyday player, and it’s not surprising that so many fans were demanding a trade. Although I didn’t think the trade made much sense in the first place, I could at least understand the reasoning behind it. The Twins were in need of another power right-handed bat and they had pitching to spare. And even though Matt Garza had a great arm, his inability to control his emotions was having a negative impact on his effectiveness (and apparently the coaching staff was losing patience with him). However, what made the trade seem questionable is that Young’s numbers (.288/.316/.408) were not good enough to be considered a fair trade for someone like Garza. It was obvious that Young isn’t really a power hitter; he’s more like Raul Ibanez: a slap hitter with some power who gets on base a lot and drives in a lot of runs. These types of hitters are not that difficult to find, and certainly aren’t worth giving up a prized pitching prospect. Having said all that, I think the Twins have been smart to hang onto Young, at least through this season. It’s not likely that they would’ve gotten anything of value for him in a trade, since he didn’t put up great numbers and it would just look as though he’s a problem the Twins are trying to dump off on someone else. I do think that Young has a lot of upside, given his age, and could become a valuable part of the lineup if he puts forth the effort to develop his talent. He’s at least aware of the fact that his numbers were disappointing last season, and has expressed a willingness to work hard and improve. And who knows? Maybe competing for the starting job will give him the motivation he needs. Written by mlblogsplunkinggomez 8 Comments Posted in Dailies	Tagged with defense (or the lack thereof), Delmon Young, hitting, questionable front office moves, sometimes it&apos;s really hard to be a Minnesota sports fan, what were they thinking? Should the Twins try to lock up Joe Mauer into a long-term deal? This is the question that has been weighing on a lot of fans’ minds lately. Some people think it’s a good idea. Some don’t (see the comment section, this is why I usually turn the fan comments section off). Let’s examine Mauer’s career numbers, and weigh the pros and cons of signing him to a big contract. Pros: On the surface, it looks like signing Mauer is a no-brainer. He is arguably the best defensive catcher in baseball, he’s won the batting title twice (no other AL catcher in history has done this), and he handles the pitching staff well. He’s a fan favorite and a hometown hero. All of this looks good, but when you really break down the numbers it becomes obvious how remarkable Joe is. Career-wise, Mauer is a .317/.399/.457 hitter with an OPS of .856. These numbers are very respectable for any position, but particularly amazing for a catcher. People tend to forget this is the the most physically demanding job in baseball, which is why most catchers have such anemic offensive production. Mauer’s patience at the plate is legendary, he has 292 career walks vs. 233 strikeouts and probably has one of the sweetest swings in baseball. Other fun facts: last year Mauer’s VORP was 55.5, his RAA was 43.0, and his 4.88 WPA led the league for position players. Coupled with the fact that he had to babysit a rookie pitching staff (which, by the way, he helped lead to a 4.18 ERA), and it is clear that Mauer is in an elite class all by himself. Cons: Mauer does not have a great health history. He missed most of his rookie season with a knee injury. In 2007, he was limited to a mere 88 starts due to a lingering leg problem that led his teammates to question his toughness. And there are reports that he isn’t going to be ready for spring training after having kidney surgery this offseason. While Mauer did make 147 starts last season, it’s clear that he hasn’t completely put his history behind him. This is obviously a big risk to take for someone who is going to command a lot of money. Some would argue that Mauer’s lack of power makes him expendable. While it’s true that he only has 44 home runs, and has never hit more than 13 in a single season, I think power is overrated in this case. A player with such a high OBP and low number of strikeouts does not need to hit for much power. Someone like Justin Morneau, who strikes out nearly twice as often, needs to hit at least 20+ homers to justify keeping his spot in the lineup. While the perfect hitter hits for average and power (Albert Pujols comes to mind) such players are rare and I would take a guy who makes contact a lot and tries to get on base over someone who hits a lot of dingers but strikes out more often than not. Of course, there is the problem that Mauer’s contract extension would eat up a considerable amount of payroll. Although the Twins are moving into Target Field, and will enjoy a substantial increase in revenue, they aren’t going to have the sort of unlimited funds available to them that larger-market teams do. Mauer would likely command an extension in the neighborhood of 8 years and $150 million, and a deal like that would restrict other moves the team could make. The Verdict: Even though he will cost a lot of money, and he’s a huge risk given his injury history, signing Mauer to a long-term deal makes a lot of sense for the Twins. They really can’t afford to lose his bat in the lineup, since it’s clear that there’s no way the team would’ve scored 829 runs last season without him. And they would have one of the best catchers in baseball while he’s in his prime. Given his history, though, and the money he’s likely to want, I would be extremely surprised if the Twins manage to sign him. More likely, he’ll either be traded after next season or leave via free agency. It’s not official yet, but the Twins have reportedly agreed to a 2 year contract with DH/OF Jason Kubel. None of the details have been released yet, but it will likely be similar to the deal Nick Punto got. The move makes sense for the Twins, as it will help control costs and buy out the first year of Kubel’s free agency (there is an option for a third year). Kubel was put up some decent numbers last season, hitting .272/.335/.471 with 20 home runs. He seems to have put the issues with his knees behind him and has settled into the DH role. Whether or not this is a good deal depends on the money invested, but if he puts up similar numbers he’ll be worth whatever they’re paying him. UPDATE: Joe Christensen is reporting that Kubel’s deal is two years, $7 million, with a $5 million option for 2011. This is a great deal for the Twins, who will get a productive hitter for a reasonable price, and then can decide what to do with him when he’s in his thirties.